Citation: Saurabh Tripathi, Tauseef Shahidi, Shruti Nagbhushan, and Niti Gupta (2018), ‘Zero Budget Natural Farming for the Sustainable Development Goals, Andhra Pradesh, India’, September. 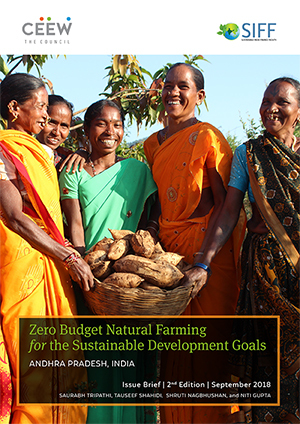 This issue brief maps the social, economic and environmental impacts of the Government of Andhra Pradesh’s (GoAP) Zero Budget Natural Farming (ZBNF) programme vis-à-vis specific targets under each Sustainable Development Goal (SDG). Once rolled out across the state, ZBNF could help Andhra Pradesh and India make significant progress towards almost a quarter of the 169 SDG targets. This mapping exercise uses data from the crop cutting experiments (CCEs) conducted by Rythu Sadhikara Samstha (RySS) in all 13 districts of the state. In 2016-17, the GoAP initiated the programme to introduce ZBNF practices to all farmers in the state. Within one year, around 1,63,000 farmers in 972 villages across 13 districts of Andhra Pradesh had adopted ZBNF practices. As of Sep. 2018, the number of farmers enrolled in ZBNF is 3,54,000. The GoAP plans to cover six million farmers in more than 12,000 Gram Panchayats by 2024 and cover the entire cultivable area of eight million hectares by 2026. 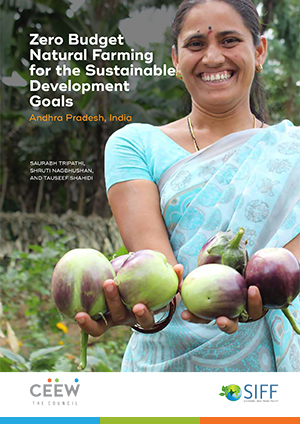 On 25 January 2018, Andhra Pradesh’s Chief Minister, Shri N. Chandrababu Naidu, and UN Environment’s Executive Director, Mr Erik Solheim, released the first edition of the issue brief ‘Zero Budget Natural Farming for the Sustainable Development Goals: Andhra Pradesh, India' on the side-lines of the World Economic Forum in Davos. As ZBNF eliminates the need for external chemical inputs, it reduces the need for credit for cultivation while enabling farmers to produce similar, if not better yields, with reduced input cost. Crop cutting experiments for both food and cash crops indicate that ZBNF farmers in Andhra Pradesh have witnessed a sharp decline in input costs and an improvement in yields. ZBNF groundnut farmers had on average a 36 per cent higher yield than their non-ZBNF counterparts. ZBNF paddy farmers had on average a nine per cent higher yield. As part of its objective to improve overall welfare of farmers and their families, since August 2018, the programme has rolled out integrated village health and nutrition plans entailing interventions such as promotion of nutri-gardens, homestead food production, ensuring water sanitation and hygiene (WASH) behaviour, enhancing the quality of school feeding programme and so on in eight districts across Andhra Pradesh, covering a total of 35 villages. The programme uses a strong community-based model for effective adoption and expansion of ZBNF. Community resource persons (CRPs) have been selected and appointed to train other farmers in the villages. As of September 2018, the programme has 4,568 CRPs covering 3,015 villages. In November 2018, another 3,500 CRPs from 1,000 villages will be inducted into the programme. ZBNF aims to utilise the existing institutional platforms of 7,00,000 women’s self-help groups (WSHGs) in the state of Andhra Pradesh for scaling, sustaining, and deepening the programme. Under the action plan of 2018-19, around 86,000 women SHGs would be engaged in the ZBNF programme. Since 2017, the ZBNF project has also started a three-year fellowship course. Natural farming fellows (NFFs) are young graduates and postgraduates from agriculture and allied streams who are required to stay in a village and practise ZBNF. There is one NFF per five villages (1 per 2,000 farmers).